Four friends helping a student record a thesis project on fear venture into the reportedly haunted woods of Amityville. August 2016 – George Harrison recruits his girlfriend Sarah Benning, his sister Elizabeth, and cameraman Simon Tressler to help record a thesis project examining personal fears. As the quartet prepares for a trip to Amityville to camp in the woods, footage plays of an incident from 19 years earlier. March 28, 1997 – Lina unknowingly moves into the infamous “Amityville Horror” house. She begins recording video diaries to send to her husband, who is away on a military deployment. After spending the day swimming in a pool, George, Sarah, Elizabeth, and Simon add Simon’s psychic sensitive friend Lisa Sheets to their crew. George begins having everyone discuss their fears on camera. April 01, 1997 – Lina mentions how she learned about the house’s history from a deliveryman who brought groceries three days earlier. A shadow passes over Lina while she sleeps that night. George interviews two local video store clerks about Amityville’s reputation for being haunted. The five friends then make their way to the woods and set up camp for the night. George and Elizabeth come across a woodsman when they go to investigate a strange howl in the trees. The woodsman tells the siblings that he is searching for his daughter who went missing a month earlier, and warns them that the woods are dangerous. April 03, 1997 – Lina tries on a woman’s dress found in a closet. She begins behaving as though possessed by the mother to whom the clothes belonged. While in the woods alone, Simon encounters a ghostly little girl. Simon reports the strange sighting to the others, prompting everyone to conduct a search for the girl. April 04, 1997 – Minor instances of paranormal activity continue plaguing Lina. A noise wakes Lina that night and she notices that the camera was recording her while she slept. The quintet retires to their tents after giving up their search. April 07, 1997 – Lina recounts more of the house’s history. She also proclaims how much she misses her husband. While the others sleep, George takes Sarah to the infamous house, revealing that they camped right around the corner. Sarah insists on leaving after being creeped out by the house. April 07, 1997 – At night, Lina is spooked by more strange noises and a presence that shakes her bed. Unable to sleep, Simon and Elizabeth talk around the campfire. Lisa becomes entranced by something in the dark distance. April 08, 1997 – Lina expresses her feeling that she is having a breakdown after calling police to investigate the previous night’s commotion, and being embarrassed when nothing was found. In daylight, the five friends encounter the woodsman again. They mention that they may have seen his daughter. The woodsman reiterates his previous warning about the woods being dangerous. George insists that they camp for one more night to complete his project. George reveals that he brought a gun for protection. April 10, 1997 – Paranormal activity plagues Lina while she does aerobics. George insists that Sarah face her fears by going alone into the dark woods with only a camera. Sarah comes back frightened after encountering the little girl. Everyone goes to look for the girl and they find the woodsman lying dead on the ground. April 14, 1997 – Lina finds blood on an exterior corner of the house. George and the others agree to break camp and leave immediately. However, they become lost. Lisa suggests that they look for the little girl to make sure she is safe. Elizabeth and Simon split up to cover more ground and when they reconnect, Elizabeth finds Simon dead before regrouping with the others. George remembers that he has a radio walkie-talkie. He calls for help, but hears only strange sounds in return. Lisa suddenly takes a camera and goes off alone, insisting that they need to find the girl. George goes after her, but they become separated after Lisa sees the girl and George doesn’t. April 15th, 1997 – The camera recording Lina while she sleeps turns to face the other direction. Lina is violently attacked offscreen. Lina flees and falls down a staircase to her death. While looking for a way out of the woods, George, Sarah, and Elizabeth find Lisa’s dead body. The trio scatters. George tells Sarah to make her way to the house while he stays behind to find Elizabeth. Someone offscreen is seen dragging Elizabeth’s dead body and placing it next to Lisa’s. Sarah makes it to the Amityville house and hides inside. When George finally joins her, she notices him behaving strangely. George pulls out his handgun and calmly shoots himself in front of Sarah. A big relief for microbudget horror filmmakers must be that by now, the bar is so low for both “found footage” and anything with the word “Amityville” that jaded audiences simply anticipate disappointment from the start. “Halfway decent” may as well be 10/10 when graded on a curve, given how poorly peers usually score in these categories. Plus, The Asylum already put out an awful “found footage” Amityville film with “The Amityville Haunting” (review here) in 2011. So even if you combine the two conceits and still tank, at least you only risk bottoming out as the second-worst Amityville movie in a first-person format, no matter how bad it gets. And things do get bad for “Amityville: No Escape.” But maybe the preface above explains why there are nevertheless small things worth appreciating about the effort, since expectations shouldn’t be set above middling anyway. With two strikes against it before the runtime starts rolling, mediocre is the best the film can hope for. “No Escape” gets partway there too, though not the full halfway required to make faults more forgivable. The first foot forward follows traditional “Blair Witch Project” formula. Text explains that recovered footage documents two separate, yet presumably related, Amityville incidents from 1997 and 2016. 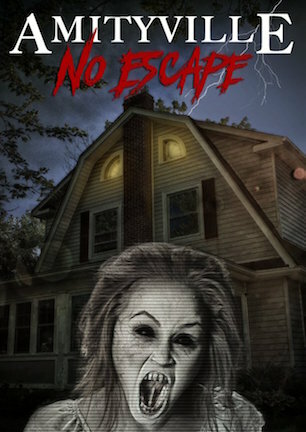 Amusingly, the description ends with a disclaimer that the footage was given its “Amityville: No Escape” moniker “for marketing purposes.” It’s unclear what need police evidence would have for PR, but the sentiment earns a chuckle. A college student who identifies himself as George Harrison, although end credits call him George Wells, is recording a thesis project examining personal fears. With his girlfriend Sarah, sister Elizabeth, cameraman Simon, and Simon’s friend Lisa, the group plans to camp in the reportedly haunted woods of Amityville, where the setting is supposed to heighten how everyone will discuss what scares them. Amityville’s reputation for curses begins and ends with one haunted house story that has since been debunked. How that extends to ghosts in a forest I have no idea. But I’ll also never understand how it is that folks in these movies, often the ones moving into the house itself, have never heard of “The Amityville Horror” before. Such is the case with Lina. On the 1997 timeline, Lina moves into the infamous address none the wiser about its horrible history. Her military husband is away on deployment, so Lina records video diaries documenting the new house he will eventually come home to. She also records videos of herself doing aerobics, among other odd activities. The thing of it is, actress Julia Gomez has an infectious amount of extroverted pep that sells these scenes as being less silly than they actually are. Her energetic chattiness works to give Lina a personality that is almost annoying, but is really rather sweet. Almost as unexpectedly, Gomez handles the switch to a melancholy mood with equally convincing command. There is good work here from an unknown actress working off a script that obviously isn’t Meryl Streep material. If someone could wrangle her away from uttering “uhm” after every other sentence, and take her tone down about two notches, Gomez might be capable of a truly striking performance under other circumstances. Co-writer Ira Gansler on the other hand, isn’t so hot in his appearance as a weirdo woodsman encountered by the camping quintet. A clear imbalance in acting ability swings between both sides of the spectrum, although the core group is adequate enough for the most part. Because the two timelines don’t connect until the final frame, intercutting back and forth makes no noticeable narrative sense. The camera is often set on auto as well, including focus and exposure. Some scenes have blown out skies and images so muddied that details wash away. “Amityville: No Escape” may not be a “good” movie, yet cast and crew deserve due credit. Complain all you want, justifiably so, about the setup being derivative, production quality being poor, and scares being schlocky. But they made a movie that required filming at night, being outside, shooting in cars, even being period accurate with 1997 sequences using a 4:3 camcorder and “Sleepless in Seattle” wardrobe. That might not sound like overwhelming commitment, but that’s more than many micro-movies do. At least “Amityville: No Escape” does something. Not only that, someone was wise enough to exploit a tenuous Amityville connection, undoubtedly the edge that drummed up distribution. Without it, “Amityville: No Escape” would be just another forgotten “found footage” film about being lost in haunted woods. June 26, 2017 by Ian Sedensky.